I have combination skin. Which, for me, means I have areas of my face that become extremely oily and also areas that become so dry that they begin to peel. When the seasons change my face experiences these contrasting conditions more. With combination skin it is hard to figure out exactly what my skin needs from season to season. No matter what the season I try to keep my pores clean and my face moisturized. That should be a good start, right? In an effort to get a deep clean and soften my skin I tried the new Shea Moisture Peace Rose Oil Complex Sensitive Skin Mud Mask. This moisturizing mud mask deeply purifies sensitive skin as it soothes and comforts. Enriched with skin-nourishing certified organic Shea Butter and our proprietary complex of Alpine, Damask and Musk Rose Oils, it leaves skin feeling soft, smooth and refreshed. I rinsed my face with water and patted it dry prior to application of the face mask. Using my fingertips, I applied a thin layer of the product to my face making sure to avoid my eyes and lips. The moment I placed the face mask on my skin I felt a tingling sensation. Once I was finished applying it to my entire face the tingling felt more like a slight burning sensation. The main areas of irritation were around my nose and chin. Initially I was very concerned. Should I wash this off my face immediately? Is this burning going to get worse? I don’t know why but I decided to tough it out and wait until the product dried. To my surprise the irritation did stop after approximately 1 minute on my face. I left the face mask on for 10 minutes and then rinsed. My face did feel very soft. However, I’ve used other face masks in the past and I did not feel that this particular one was any better than the others. I don’t understand how this was labeled a “sensitive skin” product. I don’t have sensitive skin and this product irritated my face so who knows how bad the irritation would be for someone with actual sensitive skin. I read several reviews online after using this product and found out that I am not alone in my experience and opinion of the product. Many users experienced irritation as well. I am usually a lover of Shea Moisture products but this product I will have to pass on and will not be repurchasing. I decided to look up a few natural face masks that may be better options for you. These mask recipes can be found at www.top10homeremedies.com and are pretty simple with few ingredients. * Mix til smooth. Apply to face and leave on for approximately 1 hour. Rinse thoroughly. * Mix til smooth. Apply to face liberally and gently massage into skin. Rinse thoroughly. * Mix together (add milk til desired consistency). Apply to face and leave on for approximately 10 minutes. Rinse thoroughly. If you try one of these recipes comment below. If you have your own face mask recipe, then let us know. 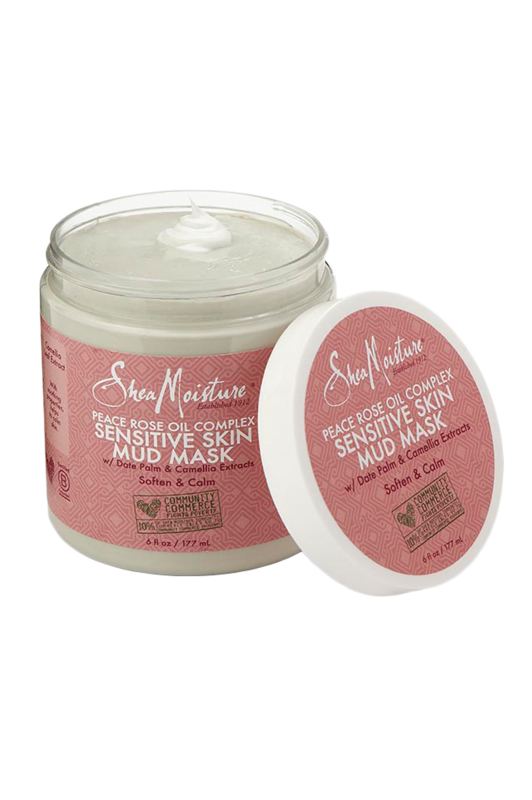 Have you tried the Shea Moisture Peace Rose Oil Complex Sensitive Skin Mud Mask? What were your thoughts? GET FREE BOOKS BY BLACK AUTHORS!